I wanted to make a Sheriff Callie themed cake for my daughters second birthday since that is her favourite show right now. I got the Wilton guitar pan and just altered the colours to make it look like Sheriff Callie’s guitar. I made the “normal” amount of icing that it calls for in a Wilton cake and then divided it into the 4 colours needed for Callie’s guitar. I made about 1/3 cup of Black, 1/3 cup of Buttercup Yellow and left 1/3 cup white. The remaining icing I dyed using no-taste red. I started by icing the red part of the guitar. I just used an offset spatula for this part. 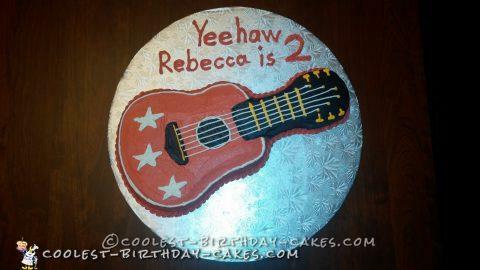 Next I did the black icing on the neck of the guitar and used an offset spatula for this as well. For the other 2 black parts, the hole and triangle I piped them on using a 5 tip and them smoothed them over using a small spatula. Next I piped on the yellow using a tip 3. Finally I used a tip 3 to pipe on the white around the hole, the outside of the guitar and the stars. I smoothed over the stars using a small spatula. Finally I piped on the guitar strings using a tip 3 and white icing. As a finishing touch I did a red rope border at the bottom of the cake to finish it off using a tip 16. My daughter loved it and knew right away that it was Sheriff Callie’s guitar.